Haunted Houses Metro Detroit 2018 – Haunted Hayrides, Haunted Houses and Haunted Halloween Attractions in Oakland County, Macomb County, the Detroit area, and the Flint area for the 2018 Halloween season. Please read the Haunted Houses Metro Detroit descriptions of some of the attractions and review their websites. Some of the content on these hayrides are very family friendly and some feature material that is far too scary for younger kids. Please use your best judgment when selecting. Friday and Saturday night rides and attractions often have older/rowdier crowds so you may want to consider going on Sundays or going before 9p if you’re going to take a child. We have a listing of low-scare haunted houses for kids page. See related posts below. A Terror in Townsend Forest Description – A Terror is Townsend Forest presented by Oakland County Sportsmen’s Club 1/2 mile of terror filled forest trails. This is a family-friendly event. Call for cost info. Haunted Hallows Description – Annual Halloween-themed camping events. Halloween holiday camping with trick or treating, haunted island, Halloween face painters, inflatables, climbing tower, campsite decorating contest, hayrides, pumpkin painting, monster puppet craft and DJ dance. Events vary each day. Call the park directly at 248-634-9811. Hosted by Oakland County Parks. For more info, call 1-888-OCPARKS. Boo Bash Description – Frightful fun with costume contest for all ages, campground trick or treating, Halloween face painting, inflatables, haunted house, family games, costumed DJ dance, campsite decorating contest, Halloween crafts and wagon rides. For more info, call 1-888-OCPARKS. Haunted Erebus Description – The Haunted Erebus 4-Story Haunted Attraction returns. With over 60 years of haunting experience, the Terebus brothers have made Erebus one of the top haunted attractions in Michigan. Haunted Blake’s Halloween Dates – Friday, Saturday & Sunday beginning September 22 through the end of October. Also Open Halloween Night. Haunted Blake’s Halloween Prices – Several ticket packages available at varying prices. 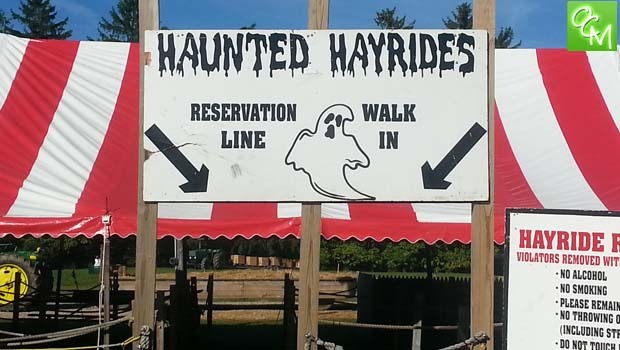 Haunted Blake’s Halloween Decription – Blake’s Haunted Halloween features “Spookyland”, “Haunted 3-story Barn, “Spookyland”, “Zombie Paintball Safari Haunted Hayrides” and more. Not recommended for young children. Haunted Blake’s is very popular. Live DJ entertainment on Saturdays and food and drink to purchase. Click here for a review of Blake’s Cider Mill. Click here for a review and photo gallery of daytime Blakes’ Barnyard Funland and Spookyland attraction. Slaughtered at Sundown Dates – September 28 – October 28 Fridays and Saturdays / Sundays 10/21 & 10/28. Sales end at 11p on Fridays and Saturdays, 10p on Sundays. Sales end at 11p on Fridays and Saturdays, 10p on Sundays. Slaughtered at Sundown Description – Not recommended for children under 8. Haunted House is in 3D, Actors aren’t allowed to intentionally touch customers. Haunted House and Haunted Hayride are said to be equally scary. Choose either or both. Haunted Farm of Terror Dates – September 14,15,21,22,28,29 – October 5,6,7,12,13,14,19,20,21,25,26,27,28,29,30. September dates are from 6:30p-1a. October Sundays and Weekdays are from 6:30p-11p. October weekends are from 6:45p-1a. Haunted Farm of Terror Description – 20 acre “Hayride of Horrors”. Features Haunted House, Hayride, and new for 2018 Zombie Assault paintball attraction. Scarefest Screampark Description – Castle of the Dead Haunted House, Hayride of Doom, Forest of Darkness, Terror Zone Haunted Maze, or Survive The Night Haunted Camping. Each attraction has their own level of fright (Hayride = least scary, Castle of the Dead = most scary). Heated Club Terror Zone bar tent featuring food and alcohol, bonfires, nightly entertainment and more. Night of Terrors Dates – Fridays and Saturdays from 7:15p-11:30p from September 22 – October 31, Sundays in October beginning 10/14 from 7:15p-10:30p, Halloween Night from 7:15p-11:30p. Night of Terrors Description – 6 Haunted Attractions in 1 location. Haunted Attractions include Splattertown Haunted Paintball, Ultimate Haunted Barn, The Asylum, The Mind Shaft, Hayride of the Lost, and Alien Caged Clowns. Wiard’s Night of Terroris designed to scare adults and children under 10 years old are not recommended. Children over 10 must accompanied by an adult. Terrorfied Forest and Manor Dates – September 21,22,28,29 – October 5,6,7,12,13,14,18,19,20,21,25,26,27,28,30,31. Fridays and Saturdays from 8p-midnight. Sundays and Weekdays from 8p-11 or 8-10p (call). Terrorfied Forest and Manor Dates Info – Haunted Manor or Haunted Forest Attraction. Not recommended for children under 12 years old. The Crypt Haunted House Date – All October weekends (Fri-Sat) plus Halloween week (Mo,Tu, Wed). Dusk until midnight on Fridays and Saturdays. Dusk until 11p on Weekdays and Sundays. Exit 13 Haunted House Dates – September 14,15,21,22,28,29 October 4,5,6,7,11,12,13,14,18,19,20,21,25,26,27,28,29,310,31 Friday and Saturdays doors open 7p. Sundays and Thursdays doors open at 8p. Exit 13 Haunted House Description – Voted best haunted attraction in Genesee County. Newly renovated and expanded. Added a 2nd attraction called Total Blackout. Darksyde Acres Description – Darksyde Acres features 7 haunted attractions at 1 location on 70,000 square feet! Darksyde Acres boasts it is “Michigan’s only haunted attraction utilizing Hollywood-style fx and scare tactics.” The Catacombs, The Rusthole, The Dark Abyss, The Labyrinth, and KlowneTowne await. Past Tense After Dark Dates – Fridays & Saturdays September 21 through October 27 from 7p-midnight WEATHER PERMITTING. Past Tense After Dark Description – Hayride of Dispair, Corn Maze of Fear, House of Horror attractions. The Amazing Corn Maze Haunted Attractions and Corn Maze in Leonard won’t be featuring haunted attractions this year. Wojo’s Greenhouse in Ortonville had a Haunted Forest attraction for a couple of years to benefit St. Anne’s church but will not have a Haunted Forest this year. Lavin’s Flower Land Nursery operated Haunted Nursery for a few years to benefit local charities but will not be operating Haunted Nursery in Southfield this year. The 22 year tradition of Haunted Hayrides at Miller’s Big Red Orchard & Cider Mill appears to be over. I spoke to a representative today that confirmed Haunted Hayrides at Miller’s Big Red Orchard will NOT take place for this year. Haunted Hollows in Armada is not operating the popular haunted attraction for this year but may come back in the future. Nightmares for Hope Haunted House in Wolverine Lake operated a small haunted house attraction last season to benefit Autism research but an arson event has closed the attraction for good. Dementia Haunted Attraction at Hampton Golf Course in Rochester Hills, MI has closed its doors to concentrate on golf. The Haunted Castle in Beverly Hills, MI ceased operations in 2011. I was told they may re-open future Haunted Houses Metro Detroit seasons but they haven’t… yet. Ladd’s Evil Acres will not continue due to the passing of Owner Adam Ladd in 2014. Adam had always reached out to us in the past to list his haunted attraction and we at Oakland County Moms were very saddened to learn of his passing. Dark Legacy of Wixom seems to be MIA, if they’re still continuing their Haunted Houses Metro Detroit, please let us know! RIP Dark Legacy 2016. RIP Erwin Orchards Haunts! “We will no longer be having our Haunted Attractions. We want to thank all of our loyal customers who patronized our haunts for the past 38 years.” – per Erwin Orchards Website 2016. October 2017 – The closing of Gibralter Trade Center looks like the end for Fear Factory. Its website is parked for now. October 2017 – Lavin’s Flower Land Haunted Nursery opened up out of the blue in 2016 after a long layoff but it looks to not be operating for 2017. October 2018 – Clio Manner doesn’t appear to operational for 2018 and their facebook page has gone silent. October 2018 – Saint Lucifer’s Haunted Asylum and Prison Break will not be open for the 2018 season. We are in the process of moving to a new location. We will be back open in 2019! Please note – This Metro Detroit Haunted Houses, Haunted Hayrides and Haunted Attractions 2018 Directory for Oakland County, Macomb County, Wayne County and Metro Detroit, Michigan will be updated regularly throughout the Halloween season. Oakland County Moms is not responsible for info or inaccuracies with descriptions that may have changed during our research. This Haunted Houses Metro Detroit page is intended to be used as a guide. Oakland County Moms does not endorse these events. Oakland County Moms is not responsible for changes to event descriptions, event times or details being altered without notice or cancellations.